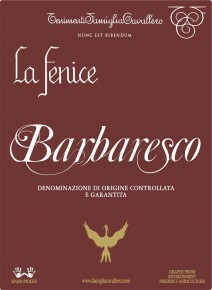 Barbaresco La Fenice is textbook barbaresco. Brilliant garnet in color and characterized by rich, spicy flavors and perfumed sweetness of ripe fruit, mint and liquorice. Elegant and refined with plenty of acidity and tannins to make it age-worthy and particularly suited for a variety of food pairings. Meat-based dishes, wild game of any type, slow-cooked stews, truffle risottos and aged cheeses. Barbaresco is one of the great wines of the Piedmont region in north-western Italy. Similar to its more famous sibling Barolo, Barbaresco is made from 100% Nebbiolo (historically it was called Nebbiolo di Barbaresco) and shares its cult status as one of the finest wines in the world. This aristocratic red was awarded its DOCG classification in 1980. Its vineyards are situated in the Langhe, on the right-hand side of the Tanaro river and extending from the area north-east of Alba to the communes of Barbaresco, Nieve and Treiso, as well as San Rocco Senodelvio (once part of the Barbaresco municipality but now part of Alba). Compared to Barolo, Barbaresco has a slightly maritime climate: warmer, drier and milder than its neighbor. This means its grapes tend to ripen earlier than those in Barolo. As a result, the wines are less tannic and more approachable at an earlier age. However there is still plenty of acidity and tannins to make this an age-worthy red. Barbaresco is characterized by its rich, spicy flavors and perfumed sweetness and is considered more elegant and refined than its counterpart, which is a more robust and longer-lived red. The grapes are hand-picked in October. The vinification process rigorously follows the traditional method. A 20-25-day fermentation at 27°C ensures that the wine will extract generous tannins and extracts necessary for a sturdily-structured wine that must have lengthy cellaring potential. In the spring, the wine is transferred to large oak botti, where it matures for at least two years. At this point, depending on the vintages, the winemaker will establish whether the wine needs additional ageing or if it is ready for bottling. La Fenice rests in bottle a further six months before release.